Feature image: On a warm spring day at Frog Level Brewing, forgo the taproom in the former warehouse for a seat next to Richland Creek. No matter which direction you walk down the red-brick sidewalks on Main Street, mountains rise up ahead of you. It’s a reminder that in Waynesville, an adventure is never too far away. For more than 200 years, this town has been a gateway to the beauty that surrounds it. In the 1800s, tourists came for the purported health benefits of the clean mountain air. Today, they also come for the town’s vibrant personality: Around every corner, you’ll find art galleries and studios. Cozy wine bars and craft breweries. A gourmet grocery and a colorful kitchen shop. Ask a local where to eat, and be ready to take notes on the farm-to-table restaurants. You could ready your hiking boots — head into Great Smoky Mountains National Park or hop onto the Blue Ridge Parkway — but you could also just stay put. Settle in. Because there’s plenty to admire and explore right in front of you. 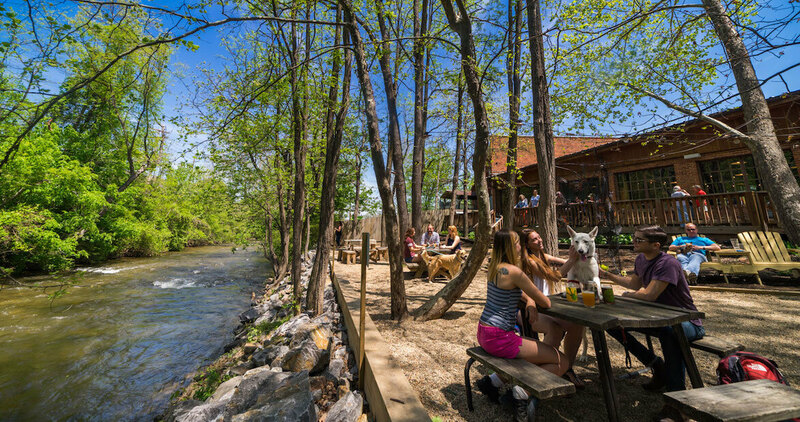 On a warm spring day at Frog Level Brewing, forgo the taproom in the former warehouse for a seat next to Richland Creek. Photos by Tim Robison. Enjoy a hazelnut latte from Panacea Coffee Company. Make room for the grouper piccata at the much-loved Chef’s Table restaurant. Head to the Classic Wineseller for an after-dinner drink and tunes from a local band like ’Round the Fire. Diana and John Laursen didn’t expect when, 17 years ago, they taught themselves to make soap with the help of a library book that their Hazelwood Soap Company would become such a hit. Hazelwood Soap Company’s handmade products have earned a cult following. Knit your own masterpiece with colorful yarn from Tia Dana. On Main Street, browse locally made pottery at Blue Owl Gallery. On Main Street, a 15-foot scrap-metal musician, created by Asheville sculptor Stefan Bonitz, pays homage to Waynesville’s rich bluegrass and old-time music heritage.